A campaign has been launched to save a building donated to the community from being sold off for private housing. Protesters want Reading's Arthur Hill Memorial Baths kept for community use, arguing the council has "no right to sell it off for housing development". The borough council said no restriction had ever been imposed "that would affect the... saleability of the site". The pool building on Kings Road was built in 1911 on land donated by the family of Arthur Hill. He was a philanthropic mayor of Reading from 1883 to 1887. 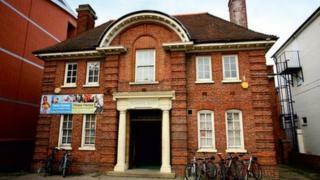 The building closed in December after the council said building repairs were too costly. The site has now been earmarked for residential development as part of the council's Draft Local Plan. Campaigner Peter Burt, who has set up an online petition, said: "The Arthur Hill site was donated to the local community in 1911 for the benefit of the general public, and it is not appropriate for the council to sell the site for private gain." Reading Borough Council said the land could house six to 10 properties, and that funds gained from the sale of the land would help pay for planned new pools in the area. A council spokesman said: "Arthur Hill Memorial Baths was acquired by the council under two conveyances dated 1911 and 1930. "There is no evidence in either conveyance of any covenants or restrictions that would affect the development or saleability of the site."